Approximately 15 years ago a new trend emerged in the fitness industry known as self-myofascial release (aka foam rolling). Self-myofascial release is a form of self-massage used to increase flexibility and enhance recovery following physical activity. The purpose of this article is to investigate the science and research behind self-myofascial release and discuss how fitness professionals can effectively implement it with their clients. Discuss the physiological benefits of performing self-myofascial release. 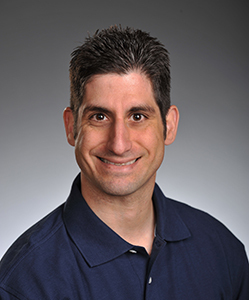 Identify current findings of peer-reviewed research concerning self-myofascial release. Describe proper technique when performing self-myofascial techniques. Roughly 15 years ago a new trend started to emerge in the fitness industry known as self-myofascial release (SMR), also known as foam rolling (Figure 1). The science behind SMR can be difficult to understand, but in all practicality it is a form of self-massage used to increase flexibility, joint range of motion, and decrease unwanted muscular tension and the effects of trigger points. The purpose of this article is to investigate the science and research behind SMR and discuss how fitness professionals can effectively implement SMR with their clients. It is important to note that SMR can be accomplished using a variety of tools beyond foam rollers, which will be discussed later. Segen’s medical dictionary (2011) defines myofascial release as, “A type of soft tissue therapy used in osteopathy to release physically restricted musculoskeletal groups. It is believed that chronic tension and trauma cause the fascia, which envelop muscle, to become fixed in a particular position, known as a myofascial restriction. Manipulation of the myofascial group is believed to resolve the restriction”. In other words, myofascial release is a form of manual (hands-on) therapy used by licensed practitioners to increase extensibility of tight and restricted fascia. Fascia: “A sheet or band of fibrous connective tissue enveloping, separating, or binding together muscles, organs, and other soft structures of the body.” (American Heritage® Dictionary of the English Language, 2011). The term ‘self-myofascial release’ has been around since the late 1990’s and many credit noted physical therapist Mike Clark for coining the phrase and introducing the method to the fitness industry (Boyle 2007). While some consider the name to be incorrectly used and suggest alternative names such as “tool-assisted massage” or “tool assisted self-manual therapy” as foam rolling may not be a form of myofascial release in the technical sense, it is a term that is now widely used and accepted (Beardsley). SMR is a flexibility technique that affects many tissues in the body including muscles, fascia, nerves, and epithelial tissues (such as skin and blood vessels). It is used to break up adhesions (knots) of the fascia and the muscle tissue it surrounds. It is speculated that sustained pressure helps soft-tissue adhesions dissipate in which the knots are corrected from a bundled position into straighter alignment along the natural lines of the muscle fibers (Clark et al 2014). Relief from this bundled position helps improve tissue extensibility, joint range of motion, and even reduce pain and soreness. The mechanism of SMR and how it breaks up soft-tissue adhesions is not fully understood, however, it is speculated that sustained pressure causes excitation of mechanoreceptors of the nervous system, most notably the Golgi Tendon Organ (GTO). The GTO is a mechanoreceptor that helps the body identify muscular tension. When excessive tension is perceived, the GTO sends a signal to the nervous system overriding the muscle spindle (another mechanoreceptor) causing a relaxation effect. The muscle spindle is responsible for muscular contraction when it senses a tissue is being stretched too fast or too far. This is a defense mechanism of the body to avoid soft-tissue injury. This entire process is known as autogenic inhibition. For example, during the bench press exercise, if the load is too heavy for the individual, after a short time of maximal exertion, the body will “shut down” signals to the working muscles and as a result the individual is no longer be able to perform the movement pattern. The similar principle also applies with hands-on massage techniques, such as a practitioner applying pressure using his or her thumb to a perceived knot in the tissue. After several seconds, the patient will feel a “release” in the tissue providing acute relief. Please note, this is an oversimplified description of the process as other mechanoreceptors such as Ruffini and Pacini corpuscles, and other neural mechanisms are also involved. Autogenic Inhibition: “A sudden relaxation of muscle in response to high-magnitude tension, which is an autogenic inhibitory negative feedback lengthening reaction that protects muscles against tearing.” (Segen's Medical Dictionary, 2011). Muscle Spindle: “A sensory receptor in a muscle that responds to the stretching of tissue. Also called stretch receptor.” (American Heritage® Dictionary of the English Language, 2011). Roughly 15 years ago there were virtually no scientific studies investigating the use of SMR, particularly foam rolling. Most of the reasoning behind foam rolling was based on hands-on manual therapy techniques such as ischemic pressure (Hanten, Olson & Butts 2000). However, since its rise in popularity, the scientific community is playing catch up and several new studies have been published, and with favorable results. The following section summarizes several studies and their findings regarding SMR’s effects on range of motion, muscle soreness, and arterial function. It is important to note, this is not a systematic review or meta-analysis of all literature, but rather a summary a pertinent findings identified by the author. A recent study Škarabot, Beardsley, and Štirn (2015) investigated the use of SMR combined with static stretching on ankle ROM in adolescents. The researchers concluded both SMR and static stretching increase ankle ROM however, the combination of SMR and static stretching displayed the greatest improvements. A similar study by Mohr, Long, and Goad, (2014), investigated the use of SMR combined with static stretching on passive hip ROM. The researchers concluded both static stretching and SMR improve hip range of motion. However, combining both techniques demonstrated greater benefits than either technique performed individually. Halperin et al., (2014) conducted a similar study to Škarabot et al., investigating the effects of SMR and static stretching on ankle ROM. The researchers concluded both SMR and static stretching increase ankle range of motion. Also of note, they found SMR has no consequences on maximal force output as compared to static stretching (static stretching may impair force production if stretches are held for periods longer than 30 seconds). McDonald et al., (2013), performed research investigating the use of SMR on maximal muscle force of the knee extensors (quadriceps). Their findings were twofold; first SMR had no negative effects on force output; and second, SMR increased ROM of the quadriceps. Sullivan et al., (2013), performed a study looking at the effects of using a hand-held roller massaging device on ROM and muscle force output. Similar to the McDonald study previously mentioned, using a hand-held massage roller also increased ROM without deficits to force output. Lastly, Junker and Stöggl (2015), investigated if SMR using a foam roller is effective for improving hamstring flexibility. 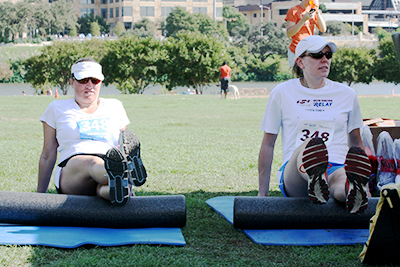 The researchers also compared foam rolling to contract-relax PNF stretching. Their results indicated that 4-weeks of foam rolling increased hamstring flexibility as effectively as 4-weeks of contract-relax PNF stretching. While the studies listed demonstrate positive outcomes for SMR, not all studies find the same results and question the effectiveness of SMR (Morton et al. 2015). Yet, as it currently stands a majority of research shows beneficial effects from SMR. Pearcey et al., (2015), investigated the use of SMR as a recovery tool for reducing delayed-onset muscle soreness (DOMS) following physical activity. The results of their study demonstrated that SMR is an effective tool for diminishing DOMS when compared to no intervention. Macdonald et al., (2014), performed research investigating the use of SMR as a recovery tool following intense physical activity. The subjects in the study all performed the same rigorous workout except one group also completed foam rolling at the end of the session. The foam rolling group displayed less muscle soreness, greater ROM, and increased force output of muscles compared to the control group. Schroeder and Best (2015), performed a literature review regarding SMR, looking at all relevant research studies from multiple databases. A total of nine studies met the researcher’s inclusion criteria and were included in the literature review. The results of the literature review indicated that SMR is an effective tool for reducing muscle soreness and fatigue following exercise. Lastly, Okamoto, Masuhara, and Ikuta (2014), performed a study examining the effects of foam rolling on arterial (blood vessel) function. Their study investigated the acute effects of foam rolling on arterial stiffness and vascular endothelial function. The results of their study demonstrated that SMR is an effective tool for reducing arterial stiffness and improving vascular endothelial function. In other words, SMR may improve blood circulation and the health of blood vessels. There are many SMR tools available for fitness professionals and they range in size, shape, texture, and density. Some common SMR tools include cylindrical foam rollers (no texture), textured cylindrical foam rollers, vibrating textured cylindrical rollers, hand-held massage rollers, massage balls, vibration/percussion devices (i.e., Deep Muscle Stimulator), and hand-held trigger point massagers (i.e., Theracane, Backnobber). When choosing a foam roll, it is important to consider the tool’s density and function. For example, clients new to SMR should use a less dense foam roll. If the foam roll is too rigid and dense, it is likely to cause the client too much discomfort or pain. As a result the client will likely either tense up or cease to perform the activity altogether. In this instance using a softer foam roll is warranted. As the client becomes accustomed to SMR, more rigid and/or textured foam rolls can be added to the routine to acquire a deeper pressure. In addition, not all body parts can be effectively or safely targeted using a foam roller, such as the cervical spine/neck, upper trapezius, shoulders, and arms. In these cases using a different modality such as a hand-held trigger-point massager or massage balls is a better option. This option also tends to be a better for obese clients or those with orthopedic limitations whom find it difficult getting up and down off of the floor. When foam rolling it is important to slowly roll a muscle group until a tender spot is located, which likely indicates the presence of a trigger point. Once the tender spot is located, sustained pressure on that spot should ensue until pain and tenderness subside by approximately 75% (Clark et al. 2014). This process usually takes between 30 and 90 seconds depending on the individual and their ability to relax. Keep in mind, one of the goals of SMR is to reduce unwanted muscular tension and hypertonicity of muscles. As such, the individual must not tense-up during the process and should consciously relax, even if mild discomfort is felt. If using a hand-held massage roller or similar device, the client should apply slow and consistent pressure as they sweep across the muscle. Avoid going too fast or creating a lot of friction across the skin. Lastly, when performing SMR, it is important to use precaution. For example, it is not advised to perform SMR on varicose veins or skin lesions/lacerations, eczema, contagious skin conditions, or sunburns. Individuals with chronic conditions such advanced diabetes, osteoporosis, or undergoing chemotherapy should consult their doctor before trying SMR, as it is likely contraindicated (Clark et al. 2014). Looking at the science more closely it becomes clear that SMR is an effective technique for improving joint range of motion, tissue extensibility, blood circulation, and decreasing muscle soreness. This is important information for fitness professionals, especially those working with clients with limited flexibility or whom are new to exercise. The science suggests SMR is an important and useful protocol to include in a client’s warm-up and cool-down as it may help prepare the body for activity and speeds up the recovery process following exercise. Also important for fitness professionals to consider is that some clients may find it uncomfortable to use a traditional foam roller; especially if the client is obese or has an orthopedic limitation, and finds it difficult performing SMR on the floor. Most hand-roller applications can be performed from a sitting or standing position and is a more comfortable and safer alternative. Lastly, clients with a chronic disease should consult their physician before trying SMR. Clark, M., Lucett, S., & Sutton, B. (Eds.). (2014). NASM Essentials of Corrective Exercise Training. Burlington, MA: Jones and Bartlett Learning. Halperin I., Aboodarda S., Button D., Andersen L., & Behm D. (2014). Roller massager improves range of motion of plantar flexor muscles without subsequent decreases in force parameters. International Journal of Sports Physical Therapy. Feb;9(1):92-102. Hanten, W., Olson, S., Butts, N., & A, N. (2000). Effectiveness of a home program of ischemic pressure followed by sustained stretch for treatment of myofascial trigger points. Physical Therapy, 80(10), 997-1003. Healey K., Hatfield D., Blanpied P., Dorfman L., & Riebe D. The effects of myofascial release with foam rolling on performance. Journal of Strength and Conditioning Research. Jan;28(1):61-8. doi: 10.1519/JSC.0b013e3182956569. Junker D., & Stöggl T. (2015). The Foam Roll as a Tool to Improve Hamstring Flexibility. Journal of Strength and Conditioning Research. Dec;29(12):3480-5. doi: 10.1519/JSC.0000000000001007. Macdonald G., Button D., Drinkwater E., & Behm D. (2014). Foam rolling as a recovery tool after an intense bout of physical activity. Medicine and Science in Sports and Exercise. Jan;46(1):131-42. doi: 10.1249/MSS.0b013e3182a123db. MacDonald G., Penney M., Mullaley M., Cuconato A., Drake C., Behm D., & Button D. (2013). An acute bout of self-myofascial release increases range of motion without a subsequent decrease in muscle activation or force. Journal of Strength and Conditioning Research. Mar;27(3):812-21. doi: 10.1519/JSC.0b013e31825c2bc1. Mohr R., Long C., & Goad L. (2014). Effect of foam rolling and static stretching on passive hip-flexion range of motion. Journal of Sport Rehabilitation. Nov;23(4):296-9. doi: 10.1123/jsr.2013-0025. Morton R., Oikawa S., Phillips S., Devries M., & Mitchell C. (2015). Self-Myofascial Release Does Not Improve Functional Outcomes in 'Tight' Hamstrings. International Journal of Sports Physiology and Performance. Nov 9. [Epub ahead of print]. Pearcey G., Bradbury-Squires D., Kawamoto J., Drinkwater E., Behm D., & Button D. (2015). Foam rolling for delayed-onset muscle soreness and recovery of dynamic performance measures. Journal of Athletic Training. Jan;50(1):5-13. doi: 10.4085/1062-6050-50.1.01. Schroeder A., & Best T. (2015). Is self myofascial release an effective preexercise and recovery strategy? A literature review. Current Sports Medicine Reports. May-Jun;14(3):200-8. doi: 10.1249/JSR.0000000000000148. Škarabot J., Beardsley C., & Štirn I. (2015). Comparing the effects of self-myofascial release with static stretching on ankle range-of-motion in adolescent athletes. International Journal of Sports Physical Therapy. Apr;10(2):203-12. Sullivan K., Silvey D., Button D., & Behm D. (2013). Roller-massager application to the hamstrings increases sit-and-reach range of motion within five to ten seconds without performance impairments. International Journal of Sports Physical Therapy. Jun;8(3):228-36.